The Fall issue of Teaching Tolerance magazine and our 2016 election resources sparked a lot of reactions from readers, from a critique of our advice to appreciation for our cover art. 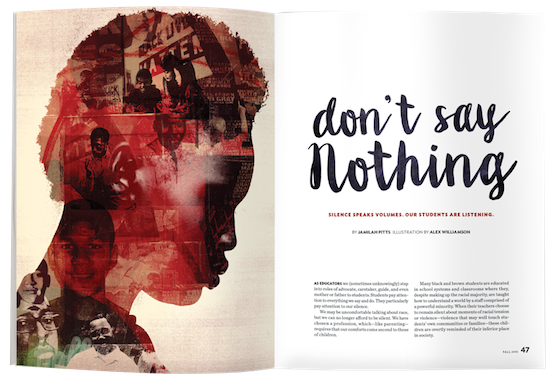 Our magazine feature story “Don’t Say Nothing” encouraged educators not to remain silent about race and racial inequality, and it got lots of attention on social media. Haven’t read it yet? Find it here. We teachers cannot stay silent and expect our students to respond to anything else we want to teach them. Reaching across the racial divide, artificial as it is, is important for the future of all of us. In the classroom setting it is very tricky to tackle the topic of race. Especially during Hispanic Heritage Month and during Black Heritage Month. I try to focus on the positive, on the music, but kids are sharp, very sharp, and they know. They know when we are glossing over things. I just read through the 2016 Teaching Tolerance magazine and it is one of the best issues you’ve published. The topics are timely and just perfect for the students to learn and be informed. [On “Breaking My Silence About 9/11 in Class”] Thank you, Teacher Phillips, for your courage to open this important discussion with your class (and yourself). So often in life, when we reveal, we begin to heal. Thank you for sharing and for jolting me out of my own silence about those horrible days. Editor’s note: We publish new blogs almost daily on our website! I am so profoundly empowered and moved to see how many resources and exquisite values that Teaching Tolerance embodies. As someone who was born into a minority group … I absolutely value the education necessary to fight ignorance, which, I believe, leads to growth in individualized forms of acceptance. I am shocked that in your article “Teach 2016” you address student questions about inflammatory rhetoric and hate speech BUT DO NOT EVEN MENTION questions students may pose about why a certain campaign is being questioned by the FBI about possible “classified” email leaks? … Your “advice” was clearly one-sided. On Perspectives for a Diverse America … Just found an amazing free online resource for multiple levels with a variety of texts. I’ve been looking for curriculum models to use with my kids at home because as much as I love our schools, we know that the narratives of history and justice need some work, and children of color (as well as all children) need to learn how to engage and value their identities in this turbulent world. I can’t even begin to tell you how truly uplifting it is seeing a young Muslim woman of color on the front cover of [Teaching Tolerance]. Thank you for the representation in these times of erasure and vilification. So today was one of those days. I teach 7th grade U.S. History II and have classes from honors to special education self-contained. I’m using your The Children’s March video and it blew up all my plans because the students were asking so many questions, good questions. Thank you! Editor’s note: Did you know our film kits are FREE to educators? You can order Mighty Times: The Children’s March and others here. [On Perspectives for a Diverse America] I want to HUG the Anti-bias Framework and everyone involved in creating it. Seriously. Editor’s note: Our Anti-bias Framework has been renamed the Social Justice Standards! You can download PDFs of the Standards in English and Spanish here. I am an elementary school counselor, and the election lessons and articles are so helpful. I just met with two fourth-grade students. … The two had an intense conversation about immigration, which led them to my office. Having this information helped to facilitate a much-needed conversation. We were able to work together to find common ground. Each person felt heard and left feeling respected. Thank you @Tolerance_org for #Civility2016 chat! And to the teachers everywhere trying to model ethical discourse in uncivil times. I treasure [Teaching Tolerance magazine]. I became familiar with it and used it extensively in my role as diversity advocate. I learned and still learn so much from it. I recommend to anyone wanting to broaden understanding [of] issues of diversity. Subscriptions are free to teachers. Have an opinion about something you see in Teaching Tolerance magazine or on our website? Contact us or mail a letter to 400 Washington Ave., Montgomery, AL 36104.